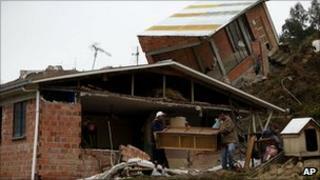 A landslide caused by intense rains has destroyed more than 300 homes in the Bolivian city of La Paz. The authorities managed to evacuate the poor Kupini II area before it was smashed by a collapsing hillside. Elsewhere in La Paz, at least five people drowned when a minibus was swept away by a swollen river. Across Bolivia, weeks of heavy rain have killed at least 40 others and left more than 10,000 homeless. Officials evacuated the Kupini II area on Saturday night after cracks began appearing in roads and bridges. "My neighbours were running around and told me to get out," local resident Maria Elena Siles told the Associated Press. "I looked out the window and there were no more homes to the left or the right of mine". Residents have been trying to recover furniture and other belongings from wrecked houses, while crews with heavy equipment try to stop the landslide from threatening other areas. Much of La Paz is built on steep mountainsides, and landslides are not uncommon, but officials say this was one of the worst the city has ever seen. Troops have been mobilised to help the evacuation and recovery efforts. So far the only confirmed fatalities in La Paz have been five people killed when a minibus fell into a raging river in the south of the city after a bridge collapsed. The Bolivian government declared a national emergency last Tuesday because of torrential rains across much of the country. The worst flooding has been in the northern Amazon lowlands, where dozens of rural communities have been cut off by rivers that have burst their banks. Bolivian military planes and helicopters have been flying supplies to the worst-hit areas. The government says this year's rainy season has been particularly severe as a result of La Nina, a climatic phenomenon caused by a shift in currents in the Pacific Ocean. In recent months parts of Colombia, Venezuela, Brazil, Mexico and Central America have also experienced severe flooding.